TARA’s adoption fee is $120. All pets are spayed or neutered, have been defleaed and dewormed, have all age appropriate shots, are microchipped, and come with 30 days free pet insurance. Please call 910-875-5791 or come see us on Saturdays at the Ramsey St. PetSmart in Fayetteville! 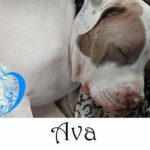 Ava is a sweet 18 month old American Bulldog mix. She is kennel trained, house broken, and rides well in the car. Ava had a litter of puppies who have since been adopted, but she is now spayed and ready to begin her new life. She loves kids, cats, and other dogs (especially Broly, her foster brother). 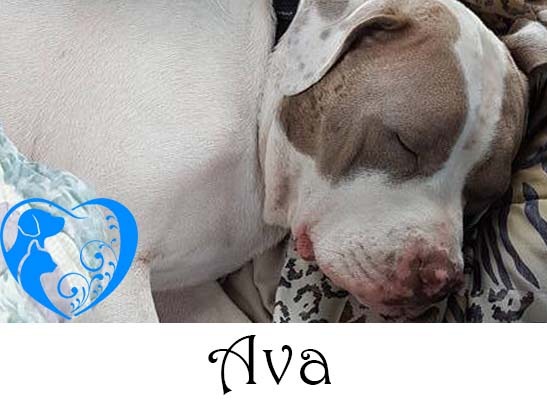 Ava walks well on a leash, loves to snuggle, and will happily sleep in bed with you. 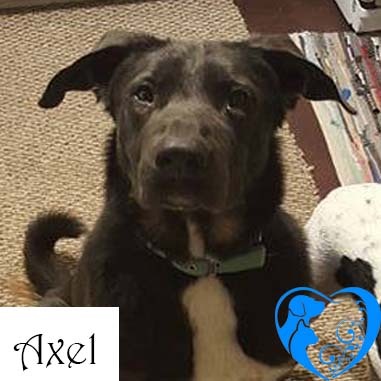 Axel is a sweet 2-year-old Border Collie/Lab mix. He loves children and is good with both dogs and cats. He knows some basic commands and is an overall well-mannered dog. This sweet boy is a senior Collie mix that had to have one of his rear legs amputated. He has adjusted to the tripod lifestyle very well and loves the fact that he now gets to live in air conditioning and has regular meals. He is sweet, kind, quiet, and appreciated being loved and having a soft spot to lay on. He naps a lot, gets along with dogs and dog-savvy children as well as cats. Henry is housebroken and well behaved in the house, no need for a crate. He can navigate a few steps, but should be in a house without the need to go up and down a full staircase regularly. He is older and has had a rough life. 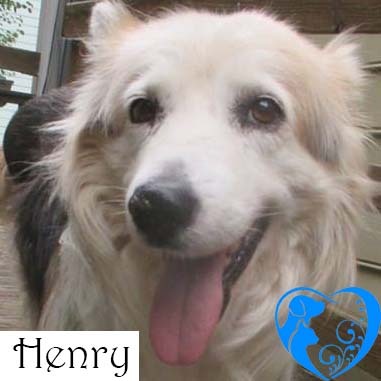 We hope that someone will be willing to pamper this old man and let him have a well-deserved rest in his final years. Jaxx was initially found as a starving mom of five pups who had given just about everything she had to keep her puppies alive and healthy. Found with no more milk to give, the little family was found with a dirty water bucket filled with dark green water and no food. Barbara Shepherd of Moore County Animal Advocates stepped in to help Jaxx and her puppies. Dr. Kelli Wofford of Longleaf Animal Hospital in Southern Pines took care of their medical needs. Thanks to the dedication of these people and agencies, Jaxx and her puppies are now healthy and safe. 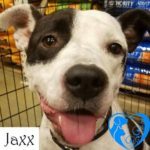 Jaxx is a terrier mix and about 2 years old. Her puppies have all been adopted out. We believe her to be housebroken; good in the crate, but can unlatch the lock if it is not secured. Jaycee is a 6-year-old boxer that often gets overlooked at adoption events. There is always a lot of noise and commotion at the events and Jaycee really prefers to be home on her couch cuddling with her humans. She is heartworm negative and loves people with a passion. If you like getting up early and heading out for a run, Jaycee is not your girl. She loves sleeping in and snuggling into the covers. 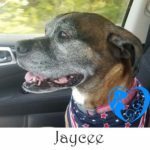 Jaycee is selective about the dogs that she likes, but gets along great with those that she accepts, as you can see from one of her photos. 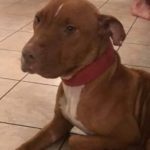 Lulu got her leg tangled in wire and was going to be euthanized until TARA rescued her. The vets at Small Animal Emergency Clinic in Vass and Animal Hospital of Fayetteville saved her life and her leg. 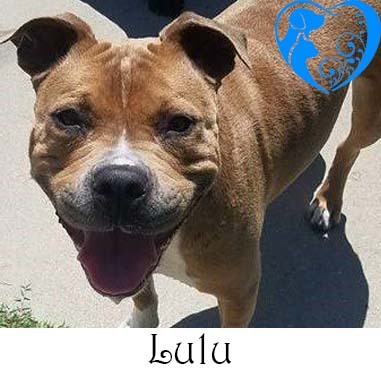 Lulu is a 3-year-old pit bull mix who had endured a couple litters. She is a sweet, very friendly girl that gets along well with other dogs, loves to cuddle, and is housebroken and crate trained. 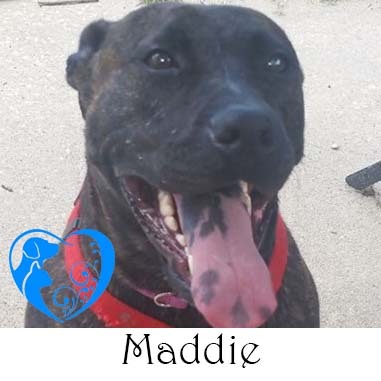 Maddie is a 1 year old female terrier mix. She is dog and toddler friendly. She loves the toddler! Housebroken; crate trained. Needs some leash work. Will work for treats and love. Starving and wounded by buckshot, Meave approached a friendly looking house and hoped that someone would help her. Moore County Animal Advocates and Barbara Shepherd got Meave to Dr. Kelli Wofford of Longleaf Animal Hospital to be treated. 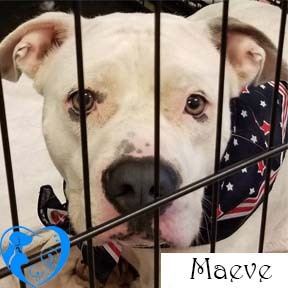 After a few weeks of healthy eating and loving care in a foster home, Meave is ready to find a forever home of her very own. Meave is a female boxer mix and is just under a year old. She is very hyper and energetic. Meave loves to play, though some dogs believe she plays a little too rough. She should be adopted into a household that has another dog with about the same energy level. A family that likes to hike is a plus! Meave does pull a bit on the leash, but that’s only because she wants to get to her adventure faster. She is very sweet and take treats gently. Housebroken; crate trained. 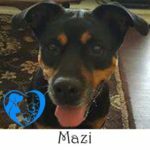 Mazi is a 10-year-old Rottweiler mix with significant separation anxiety. She will need to go to a home that understands her issues and is willing to work with her. Mazi is very sweet and will happily follow her human around the house from room to room. Once settled, Mazi curls up and sleeps happily. She is good with other dogs and cats and likes children. She will not, however, share her treats or toys. Mazi should be given high value treats, like pig’s ears and hooves, apart from other pets. Mazi cannot be crated and should not be left alone. In the past, she has done damage to a crate, some molding, and herself in her panic at being left alone. 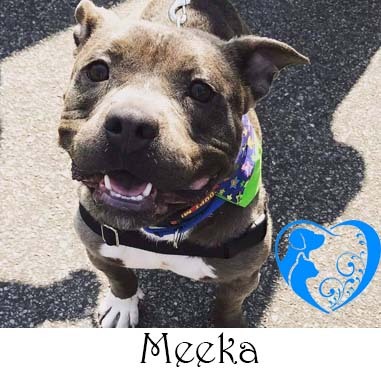 She has lived in three foster homes during the time she has been with TARA, and all three fosters fell in love with her sweet personality. 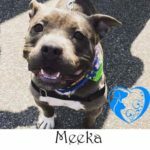 Meeka is an outgoing, friendly 2 year old female Stafford Bull Terrier Mix. She loves people she knows, new people she meets, and even those people that she hasn’t met yet. Housebroken; crate trained. 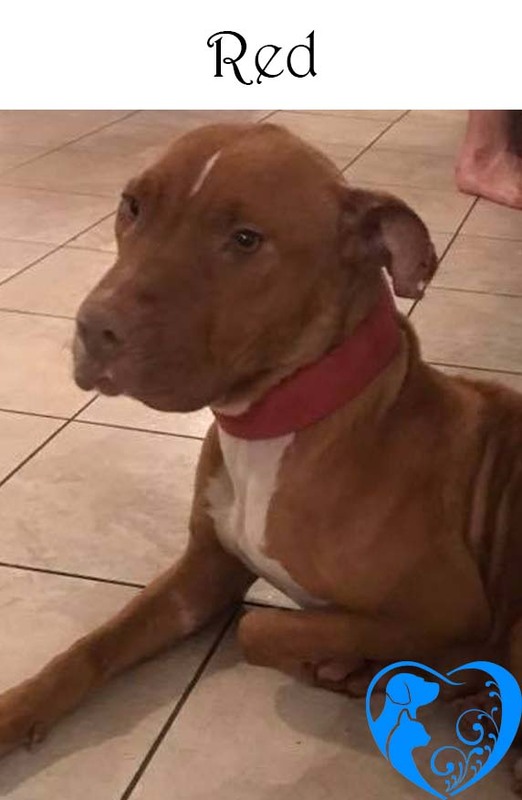 Red is a 2-year-old female pit pull terrier mix. She plays well with other dogs and loves children. While Red is a bit shy in the beginning, she warms up after a few days and loves to play with her humans. She loves car rides. 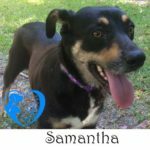 Samantha is a totally adorable 3 year old shepherd mix. She is sweet, but very shy. Her confidence is growing, but she will need some love and training to really be the best dog she can be. She is housebroken and crate trained, gets long with other dogs and probably cats – we think. Samantha is another dog that was initially rescued by Barbara Shepherd of Moore County Animal Advocates and vetted by Dr. Kelli Wofford of Longleaf Animal Hospital. She (and TARA) will be eternally grateful for their help in getting Samantha ready for her new life. Shakespeare is a 5-year-old Olde English Bulldogge. He was initially rescued from a breeder/hoarder in Texas, but he is unhappy in his current home. Shakespeare would prefer to in a home where he is the center of attention with humans devoted to him. He will not tolerate cats in his home and would prefer not to share attention with small children. Shakespeare will, however, cuddle in bed with you and spend all day binge watching Netflix. As a short-muzzled dog, Shakespeare does not tolerate the heat well and must not be left outside unattended. He is housebroken and crate trained. Shakespeare knows how to use a doggie door and can be left alone unsupervised. He is non-destructive, but he will sleep in your favorite chair. 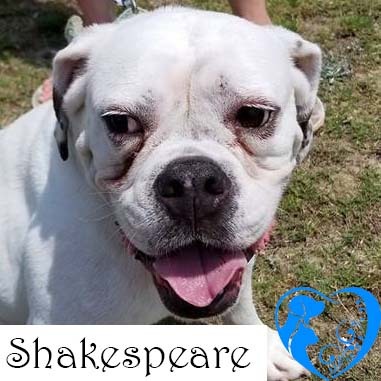 If interested, please call 910-875-5791 as Shakespeare does not often attend adoption events. Stella is an energetic 4-year-old red merle Australian Shepherd. She loves people, but is not keen on most other dogs. This beautiful girl has a lot of energy so she required a fenced in yard. 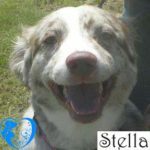 Owners with previous Australian Shepherd experience are highly recommended. Housebroken; crate trained.